Using video fragments found by the artist. Found on the web, PC buffer exchange, PC rubbish basket, damaged VHS, broken DV files. The deepest thing in us is our skin, we live on the surface of skin. The game, to which the author draws our attention, is based, on the one hand, on many interpretations of reality, and pluralist interpretations of means of reacting to the reality presented by culture on the other. The author intentionally leaves no notes, tips and guidance on the content of the work, giving the recipients the freedom of perception and interpretation. The construction of the quotes forms a polyphonic semantic space (inter-text). Following Roland Barthes, we cannot fail to notice that «the basis of the text is … its output to other texts, other codes other signs.» We step into the space of one frame and go in a completely different space, we are thrown out of a frame by an atomic explosion within a frame with a figure skater, and again we plunge into the associative array, linked to cognitive experiences and basic illusions inherent to us. Structurally this video is a sum total of video fragments – texts of culture, that present themselves as a monolith field of meaning transfer, that does not stop anywhere as a motionless image of reality. These fragments were found deep inside the subsoil of the information field: in the basket (physical and virtual removal), in the clipboard of a computer (not existing in actuality); in the web (first random choice) and on the film of the old, thrown away and broken VHS tapes (barely restorable digitized fragments). 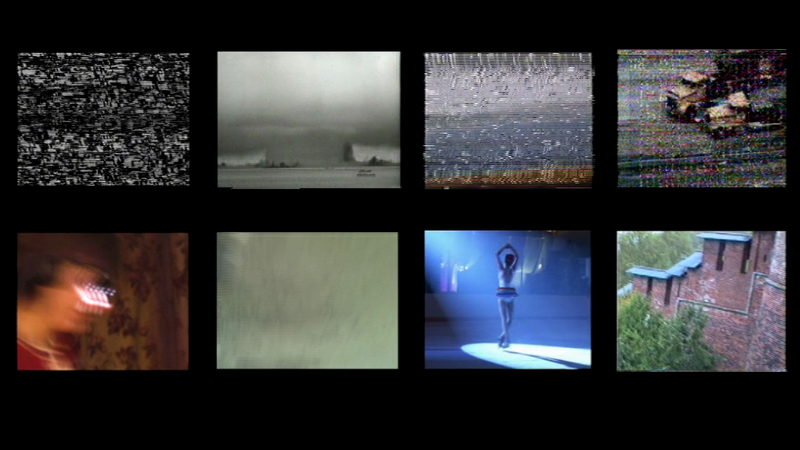 «Eight Found Video Fragments» exists in the consciousness of the recipient as an «invagination» of each and every text into the other, enabling an endless interpretation of one text by the other.